Nazarbayev resigns: "Religious freedom one of his flagships"
The Bishop of Almaty: "A year dedicated to the Sacred Heart of Jesus: catechesis begins in Kazakh language"
Astana (Agenzia Fides) - "For a quarter of a century, Kazakhstan and the Vatican have created favorable conditions for a progressive improvement of bilateral dialogue at a political, humanitarian and scientific level. The interaction between the two states strengthens peace and stability, as well as interreligious dialogue, a topic that occupies a special place on the agenda of bilateral co-operation": this is what is stated in a note by the Ministry of Foreign Affairs of Astana to Fides on the occasion of the 25th anniversary of the diplomatic relations between Kazakhstan and the Holy See, which is celebrated in 2017. 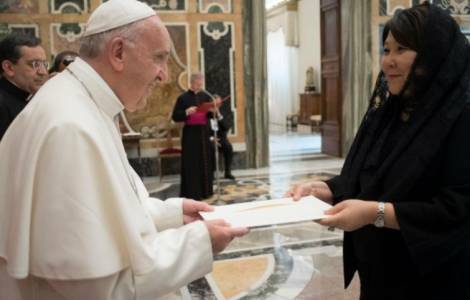 It was October 17, 1992, when Pope John Paul II issued the brief "Partes Nostras", a document that established the apostolic nunciature of the Kazakh state. The date marks the beginning of a journey of mutual knowledge and collaboration: this was testified by the three official visits of President Nursultan Nazarbayev in the Vatican (which took place in 1998, 2003 and 2009), but above all the pastoral visit of John Paul II in Kazakhstan in September 2001. On that occasion, Pope Wojtyla, in the meeting at Eurasia University in Astana described Kazakhstan as a "land of encounter, exchange and newness; a land which stirs in everyone the desire for new discoveries and makes it possible to experience difference not as a threat but as an enrichment". According to data provided by the Kazakh Foreign Ministry, there are more than 130,000 Catholics in the largest Central Asian state. "It is a data that, in reality, should be reviewed", notes to Fides Fr. Guido Trezzani, a missionary in the diocese of Almaty for 22 years. "We are still suffering the emigration legacy: once the Catholic communities were constituted by several ethnic groups, formed mainly by ex-deported of the Soviet regime", he explains. "After the 1990 independence – he continues - many of them returned to their respective countries of origin. The phenomenon continues, due to the economic situation: there are no jobs in the villages, so whoever can, goes abroad. The challenge for the future is certainly to continue the work of evangelization, creating a more conscious journey of faith and less tied to tradition".